Memory Bears made to order. 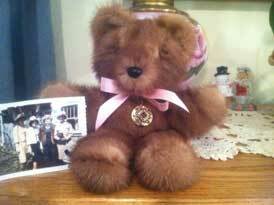 Memory Bears are the handmade creation of a woman living right here in Massachusetts. Our Memory Bears are entirely handmade and come in small, medium or large. The idea is to use any clothing that reminds you of that special someone. Our prices for the Memory Bears are very reasonable. If you have special requests that require additional work, the prices will be adjusted accordingly. A most special gift of love. If you would like to find out more, contact us.